Harbor redevelopment plays a significant role within coastal regions because they offer opportunities for large scale economic development. Redevelopment of harbors is beneficial because it can help a region build up its economic and social potential. Recently, there has been a large amount of redevelopment activity in various harbors within the United States, including Baltimore, Milwaukee, and San Diego. Besides the implementation of technology within a harbor, harbor redevelopment can also include the construction of new buildings and infrastructure. Architects and engineers are responsible for the design of new structures which requires a lot of coordination and planning with one another. Developing a proposal for a city’s harbor can be difficult due to the need for uniqueness and creativity as well as meeting a city’s requirements. Ultimately, developers must create infrastructure that supports the harbor’s unique environment. When constructing infrastructure and buildings, it is important to ensure the design is beneficial for the surrounding environment and public. Extensive research should be conducted beforehand to create the most optimal design. Corporate Office Properties Trust (COPT) is a real estate trust company based in Maryland that developed a plan seeking approval from the city. The $1 billion development project would create 1.1 million square feet (sqft) of office buildings, 100,000-square-feet of retail and dining space, a 300 room hotel, 350 residential units, and 200 marina slips on a new pier. The proposed development would enlarge the waterfront promenade and incorporate a green space. This huge development project would lead to significant changes within the Inner Harbor area by increasing the amount of public activity and economic commercial potential. The San Diego port district recommended a proposal created by OliverMcMillan Inc. in order to move forward and redevelop the harbor area. OliverMcMillan Inc. developed a plan to construct hotels, a “boatel,” recreational canals that support kayaks, paddleboards and small watercraft, and a public administration campus for the Harbor Police Department. The plan incorporates a mixed-use concept where various hospitality, retail, office, BlueTech, building, public market restaurant, and marine services would be developed. Specifically, the BlueTech development would be a space dedicated to research and development relating to the marine environment. Another unique aspect of the plan is to construct a seaplane exhibit that would include open spaces and piers providing individuals with an area to connect and enjoy the harbor. The variety of uses available within this development connects the community with one another and offers an abundance of activities for individuals. An issue with redevelopment for developers at this harbor location is maintaining the existing commercial fishing operations. A company, Tuna Harbor Dockside Market, expressed and stated the technical and infrastructure requirements needed to allow their fishing operations to continue in the future. Potential developers must incorporate existing businesses that have a significant presence within the harbor and figure out a plan that won’t compromise their operations. Milwaukee’s Harbor District desires to develop a water and land use plan by 2017. Four consultants were hired by the city to discuss future plans. The consultants examined the region and provided input to influence the water and land use plan. Each consultant came up with a proposal for the harbor, with a major focus on developing the city’s coal pile property which will soon be empty. One of the challenges consultants face is preserving existing activities and businesses within the area while adding new uses and infrastructure. Designers must determine where new development fits in and what the balance is for incorporating industrial uses versus residential uses within certain areas. Mixed-use planning can be beneficial, however individuals most likely do not want to live near an industrial factory. Most consultants developed similar concepts for potential designs. Three consultants advised the city to keep industrial uses in a particular area, Jones Island, while supporting new development on the harbor’s western bank. Another significant aspect to each plan was the addition of green spaces. Within these proposals were unique ideas to create river walks, an “experimental landscape” to research plants and technology, a beer garden, and a 3 mile breakwater. Each proposal was created to provide an innovative concept designed to repurpose Milwaukee’s harbor area. With the utilization of modern technology, the potential for harbor redevelopment is even greater. Utilizing computer modeling software and simulation software assists designers and developers with creating an improved and rehabilitated harbor design. A modern harbor design can incorporate new technology, such as sensors, to create a more efficient harbor. Implementing modern technology in a new harbor can create a safer and healthier environment for the city. Tetra Tech, headquartered in Pasadena, California, was involved in modeling and engineering a design for the harbor in Savannah Harbor, Georgia. Tetra Tech utilized their 3D modeling system and watershed tools to examine the harbor and surrounding watersheds to prevent negative impacts that may occur from deepening of the navigation channel. The modeling system assisted in evaluating the potential effects, such as possible increased salinity in the river and marsh, decreased oxygen in the channel, thus impacting some endangered species. Tetra Tech is planning two mitigation projects to prevent these events from occurring. Overall, Tetra Tech was involved with surveying, geotechnical fieldwork and analysis, environmental permitting, and engineering design activities for this project. Baltimore’s Inner Harbor contains an innovative feature consisting of a water wheel, also known as a trash wheel, designed and constructed by Clearwater Mills, LLC, from Pasadena, Maryland. The snail-shaped structure serves the purpose of collecting litter floating on top of the harbor’s waters. 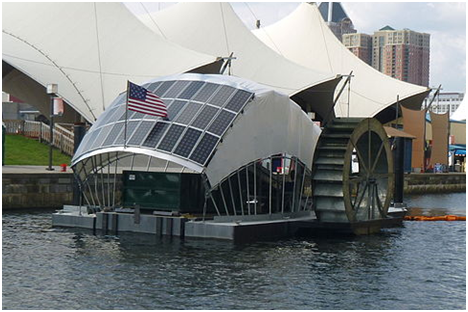 The water’s currents create power to turn the water wheel in order to collect garbage from the water and transfer it into a dumpster barge. In the event that the water current isn’t strong enough, solar panels generate power for the machine. When the dumpster is full, a boat comes to take away the dumpster and replace it with a new one. Baltimore’s trash wheel has been in operation since May 9, 2014, and has since collected 483 tons of garbage. The greatest amount of trash the wheel ever gathered in one day was 38,000 pounds. The addition of this innovative machine to the Baltimore’s harbor ultimately creates a healthier waterway, all while implementing an environmentally friendly process. The harbor in Charleston, South Carolina utilizes a Physical Oceanographic Real-Time System (PORTS) designed by the National Oceanic and Atmospheric Association headquartered in Washington, D.C. to relay real-time data to ship operators. The system utilizes sensors to capture the water level, wind speed, barometric pressure, and fog visibility. The availability of this data decreases the number of potential accidents that can occur between vessels. The sensor technology is powered by an AC source or solar charged battery, and communicates through satellite and IP sources. Once data is collected, it is transferred through the Internet and a unique phone system, allowing users to obtain information through a mobile device. The implementation of the PORTS system assisted Charleston’s harbor to become a safer and more efficient pathway for ships to pass through. Harbor redevelopment offers many advantages to cities due to various social and economic opportunities. Individuals involved in the development process include planners, architects, and engineers who partake in innovative and technical activities. These particular activities make architectural and engineering companies eligible to receive federal and state R&D tax credits.